The first exhibition that caught my interest was the “Lollygagger Living Range”, designed by US based company Loll. This sleek looking plastic furniture is manufactured from recycled milk bottles and detergent packaging. The range consists of outdoor lounge chairs, tables and planters, ideal as patio sets. The word “Living” in part of the range’s title, could be a reference to “keeping things going” through recycling materials that would have otherwise been thrown away and wasted. The plastic materials are transformed into HDPE (High density polyethylene) by Metem. 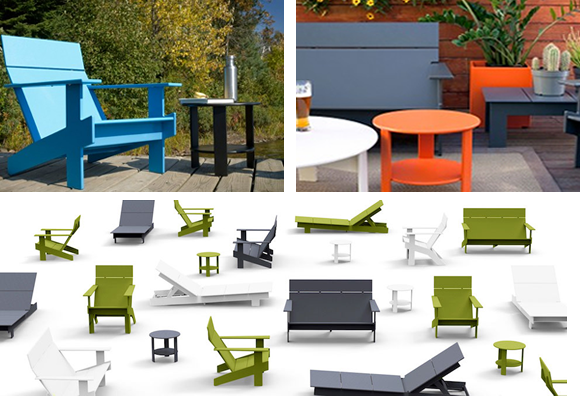 The HDPE material that is manufactured makes the furniture more durable to outdoor conditions. When the furniture’s purpose has been achieved, the pieces can be recycled after their long lasting period of use thus emphasising that the life cycle of the range will always continue on. For comfort, the style of the chairs are based on the same design and angles as the “Adirandack” chair, which can be seen as another factor that emphasises an ongoing process and keeps to a popular style of chair for use outdoors. The exhibition must have been an exciting one to see, not only due to the contemporary use of style and fantastic colours, but also due to the process of recycling with Earth’s welfare being on everyone’s mind. London based design company, Forpeople designed a range of office chairs that are specially designed to accommodate users who tend to fidget… Sounds ideal for someone like me! Named the “Keyn” chair, the seating range is manufactured and styled with a flexible seat shell that remains in contact with the user as they move position whilst sat down. Working closely with “Herman Miller”, the designers at “Forpeople” ensured that they met the consumers’ needs and created this marvellous seating range. 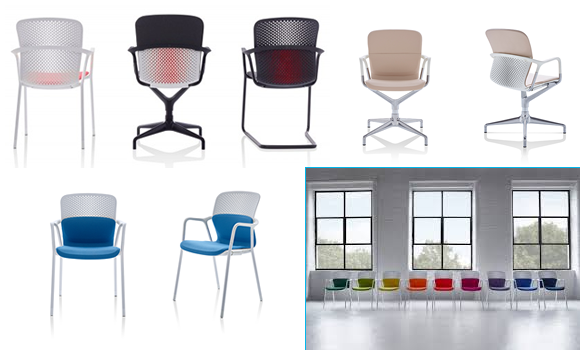 With different colours and several configurations to choose from, the Keyn Chair is a fantastic seating range to add to the amazing Herman Miller collection… Practical as well as aesthetically pleasing. White Arkitekter set up a temporary pavilion that invited local residents and visitors to “engage in the art of making”. A museum being a building in which “objects of historical, scientific, artistic or cultural interest are stored and exhibited” the name of this exhibition couldn’t be more spot on! 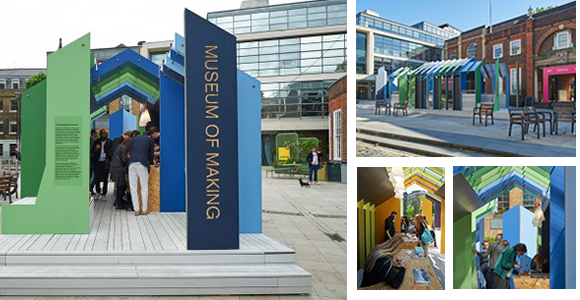 The temporary pavilion was situated in the centre of the Clerkenwell festival, “celebrating Clerkenwell as one of the most important design hubs”. The design of the pavilion was based on a Swedish barn, reflecting White Arkitekter’s Scandinavian heritage and integrating their agricultural roots into an urban surrounding. The structure of the museum used colours such as green, yellow and blue to represent the countryside. The open space that was created may also have emphasised that inspiration can come from anywhere, even fresh air. It may also have emphasised that there are no boundaries when it comes to the art of creation and design. 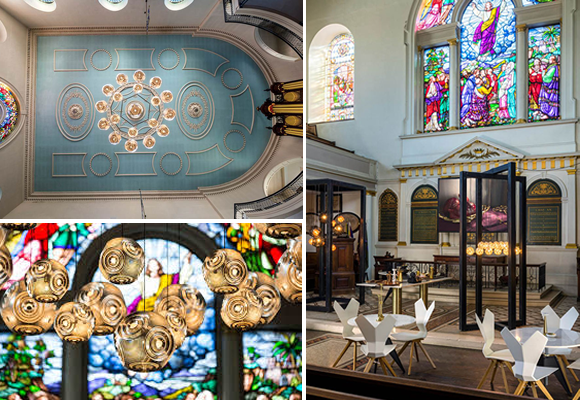 British designer Tom Dixon collaborated with the vicar of St James, Andrew Baughen to exhibit a large central chandelier, a co-working environment and a kitchen within the main space of the church. They were donated as permanent fixtures as the festival ended, keeping the design “magic” going. The co-working and meeting environment that was created also represented the communal place that churches were so often used as throughout earlier centuries. Drawing the public into the 17th century church, Tom Dixon exhibited a fantastic chandelier with his “Curve” lighting range within the main part of the structure. Suspended from the ceiling, the public admire the artistic decorative ceiling as well as the contemporary lights. The gold finishes on the lighting complements the organ pipes and the natural light that comes through the stained glass window is subtly reflected from the cleverly designed lights. A design that underlines the idea that light and thus life is brought into the church. The contemporary designs bring the 21st century and fuse this with the 17th century and in doing so represent the evolving change that the church is going through as time continues to flow. What would a design festival be without a furniture showroom that wasn’t constricted to one space…?! Dynamic Office Solutions attended the Clerkenwell Design Show in their mobile showroom in the form of an old London double decker bus (appropriately), nicknamed their “Popular Marketing of Mass Destruction”. Fitted out with a few examples of their fantastic furniture ranges, the on-the-move showroom showcased wonderful ranges and offered refreshments to their visitors. I just hope they didn’t receive a parking ticket! Being on-the-move, the showroom was able to drive around raising plenty of awareness and allowing interested visitors to have the showroom come to them. Ideal! Gracing London with some heritage in honour of the TFL, great contemporary furniture items, finishes and (hopefully) decent coffee. These are of course only a few of the exhibitions that grabbed my interest last week. There was lots to admire and plenty to be inspired by! I will have to do my best to attend next year and be part of it all. London should be proud to have hosted such a lovely design week!